"Sometimes, if you want to be happy, you've got to run away to Bath and marry a punk rocker. Sometimes you've got to dye your hair cobalt blue, or wander remote islands in Sicily, or cook your way through Mastering the Art of French Cooking in a year, for no very good reason." 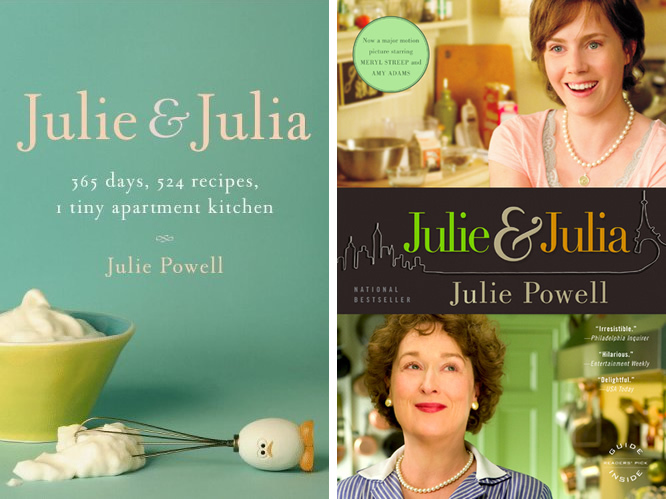 Apparently, this is what Julia Child- famed chef, television 'how-to' girl, and author- taught 30 year old Long Island City secretary Julie Powell. And actually, by the end of 'Julie and Julia', I consider it a lesson taught to me, too. Powell chronicles her traverse through every one of the 524 recipes of Child's Mastering the Art of French Cooking with charm and, surprisingly- considering the backlash she encountered online and in the press recently (thanks, Google)- elegance. I'm a total foodie, so I lapped up the evocative descriptions of Creme au Beurre a la Anglaise and Oeufs en Gelee as much as the profanity-laced, misanthropic story of one woman finding her place in the world through food, and following her heart. The beginning of the novel seemed to me a little shaky, with trips down memory lane seemingly filling the empty pages when really, the book blooms by the middle when Powell finds her stride in exploring her job, her marriage, her unhappiness, and ultimately her salvation. So what I'm saying is- stick with it. It gets better. Mostly inspirational, sort of life-affirming, and definitely hunger-inducing, one can't help but read this and come away with an enormous feeling of well-being.